Villa Maridadi is what dreams are made of: incredible ocean views, stunning sunsets and luxurious open-air living amidst vivid green rice fields and rustling coconut palms. Just metres from Cemagi’s black sandy shores and the revered sea temple Pura Gede Luhur Batungaus on the island’s south-west coast, this five-bedroom villa with 18-metre swimming pool embraces peace and tranquillity offering real insight into Bali’s traditional way of life. 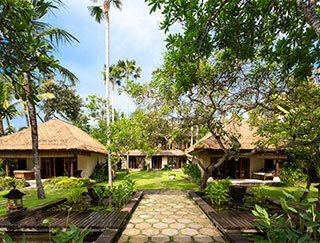 Enhanced by the warm hospitality of a caring staff team, and classic Balinese architecture, this relaxed and comfortable home is the perfect place to unwind, slow down and disappear into a secluded paradise. Dine on delicacies prepared by the villa chef, fall asleep to the soothing sound of the waves and awaken to a private oasis – a stay at Villa Maridadi is an experience you’ll never forget. 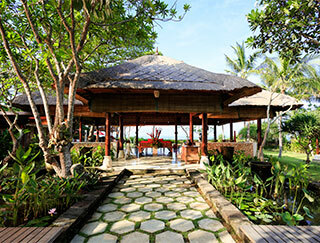 Villa Maridadi’s wooden Balinese doors open to reveal a seated Buddha statue holding red hibiscus flowers. Stepping-stones lead guests across a fishpond full of lush aquatic plants to a paved promenade where two striking red pillars featuring antique temple windows provide a focal point (and a centrepiece to the villa logo). From here a path continues to the broad, open-sided living and dining area that overlooks the pool. The five air-conditioned bedrooms, each with ocean views, are located in four separate pavilions throughout the villa compound where intriguing artefacts and sculptures evoke a spiritual and tranquil ambiance. This stand-alone, ocean-view suite features a lofty thatched roof, ceiling fan (in addition to air conditioning) and solid teak floors. The bedroom is accessed via two sets of sliding glass doors, one opening onto a patio where daybeds beckon. Back inside, beautiful Javanese wood is crafted to form the super-king four-poster bed and a decorative wall carving. Teak wardrobes provide plenty of hanging space. In the bathroom, a cream terrazzo tub shelters beneath the thatch while the shower stands open to the elements in a sunny walled garden. Connecting to the bedroom is a study furnished with a writing desk and a large window seat from which to view the flat-screen satellite TV with DVD player. A trundle bed or baby cot can be set up in the study which, together with the adjacent garden shower room, makes an ideal suite for young families. Two master suites are housed in separate buildings behind the living and dining pavilion and also feature teakwood floors and alang-alang thatched ceilings. Interesting artefacts and bright abstract paintings distinguish the two rooms, however both feature king-size beds draped in mosquito netting, ceiling fans (in addition to air conditioning), and stone-walled garden bathrooms comprising a cream terrazzo bathtub and wash basin plus an open-air Palimanan stone shower. A patio area provides the perfect place to take in the ocean views. Directly behind the master suites is a large two-storey building fitted out with a games/TV room upstairs and two guest bedrooms downstairs. Both light and airy bedrooms feature large twin beds (which can be converted into a king bed, and have trundle beds underneath) – perfect for children – and a garden bathroom with open-air shower.